If passed after consultation housing will be built on the southern section below the red line. Land on the southern section of the park will be taken away and built on and some land from the recycling centre will be added. The red line is the demarcation of the proposed park after development on the southern section. We are appalled and flabbergasted at this threatened loss of a substantial and valuable part of the park. FDLP have started to mount a public campaign to save our park. Facilities which would have to be moved from their present location in the southern section into the remaining smaller park are the childrens playground, basketball court, tennis courts, sports changing rooms, toilets, some flower beds and a pre-school community nursery. The bowling green may also need to be moved. Down Lane Park is also known as Down Lane Recreation Ground. that approval be granted to community consultation on those principles and the proposals ". The southern section of the park below the red line is the area proposed for a new housing estate. Part of the recycling centre is the area proposed as recompense. The red line is the demarcation of the proposed park after development on the southern section. Haringey Council decided mid 2008 to move the Park View Road Recycling Centre to Marsh Lane. Instead of funding this move through normal procedures it decided to raise the money through selling land for development. Land in the vacated recycling centre and the southern section of Down Lane Park would be sold to raise enough capital (we hear £10-20 million) to fund the move of the recycling centre. The proposition as put before us now is to build blocks of flats, 5 stories at the top and 8 stories in the bottom of the park. The park will have high rise buildings on three sides destroying its openness. The original Tottenham Hale Masterplan(2006) did not envisage building on the southern section of the park. This new building proposition only came to be a public proposal in the second phase document “Transforming Tottenham Hale, Progress and Next Steps" July 21st 2009 when it was presented to cabinet.. Members agreed on the nod, without question, to ‘approve the principle’ of building on the southern end of Down Lane Park. selling council land for development to finance capital projects. building on land that has a major deteriorating impact on the local environment. Haringey's cabinet's, on 21st July 2009 , approval of the principle of building on open land is completely opposite to the policy adopted in 2006 in the Unitary Development Plan (UDP).Haringey Council adopted its UDP on 17 July 2006 setting out policies in how land is used within our borough. "Existing open spaces should not be built on unless an assessment shows the open space is surplus to requirements. " We insist that Haringey’s Cabinet readopt the principle that park land is sacrosanct and that no part of Down Lane Park be taken for development ever. Instead Haringey should fulfill the commitment in the original 2006 Tottenham Hale Masterplan "to enhance the park and improve the southern section of the park , which could include a new children's play area and new youth facilities". In 2006, the Tottenham Hale Masterplan was produced for consultation. Many local people were very pleased as it planned improved resources for the area. Since 2006 many parks across the borough have received wonderful improvements but not a penny has been spent on the children’s and young people’s facilities in Down Lane Park. Friends of Down Lane Park had been meeting a brick wall everytime we asked about funding for repairing, renewing, renovating the park. This was especially true when we asked about planning gain from the nearby local developments. Now we know in part why. Since the decision to move the Recycling Centre was taken some leading officers (and councillors?) had decided that they were not going to repair/renovate the childrens and sports facilities because they had earmarked that part of the park for a planned housing development. 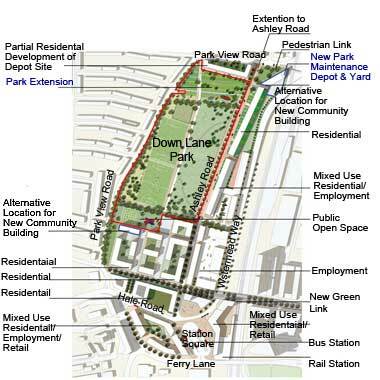 Leading up to the July announcement approving the principle of building on the park, Haringey’s Cabinet allocated money from the Governments Growth Area fund for the designing of a new playground for Down Lane Park. Consultation went ahead on where to put the new playground. However when consulted, people were encouraged to choose areas of the park other than the site of the present playground. People genuinely believed that they were having a real say and that the site would be chosen on it merits. However officers who were doing the consultation were obliged by senior officers to hide the fact that Haringey intended to build houses not play areas on the present site and that this was the real reason that the present site was not being promoted. The senior politicians and officers who commanded this, corrupted the consultation process. In light of this how can anyone trust Haringey to carry out a genuine consultation. In May 2009 Haringey's Cabinet allocated £85,000 from the Government Growth Area money to the design of a new children's play area for Down Lane Park. In July the same Cabinet approved the principle of building on the southern end of the park which includes the present play area. This may delay the design even of the play area beyond the life of this Council administration and beyond deadlines for getting government money. This makes it all the more essential that Haringey Cabinet immediately rescinds its approval of the principle of building on Down Lane Park. We have ascertained that not enough definite money has yet been committed to the building of it. Haringey Council has never committed a penny beyond what is left of the £85,000 after design, to renovating the park . The most that has been offered so far is that the GLS site developers will be asked if they would give £300,000, of the £2million they already owe for environment improvements, towards a new children's playarea. This money, officers emphasise, is not definite. The Cabinet report 21st July 2009 sets out a plan to build a housing estate on the southern section of the park and proposes to add part of a vacated recycling centre to the park in recompense. It does claim that there will be no net loss of publicly-accessible space but does not claim that there will be no net loss of park land. In fact the land added in recompense is 10% less than the land taken to build on. Importantly some facilities will have to be replaced to the central area of the park making this open area narrower. The central area of the park has currently a variable no (2 or 3) full football pitches. On weekends especially groups of local young football players with their volunteer coaches as well as families play their games and need space outside the larger football matches area . This playing area was also narrowed in the previous swap in 1989. *Note: Our vision of the renovation/regeneration of the park includes a sports complex, part of which which could be sited along the side of the park where the basketball court, area maintenance depot and commuter car park are now situated. So though some of this park land is not officially now publicly-accessible open space it can return to such when retained & developed in the park. Our scenario would leave the present width of the central of the park untouched. In the 1980s Haringey Council cut away the eastern section of the park and created a road and Techopark from it. The rationale was to create jobs for Haringey people. Its’ employment objective failed dismally and now the new Haringey proposal is to knock down the Technopark and build a mix of housing /employment. The road will still stand. A good amount of the southern section never got converted into either grass or park facility and is still concrete and built on. It has a car park for commuters.!! So much for like for like. Today the children’s play area has limited and poor facilities (wonky swings etc) and the sports area is equally in poor shape. Installed in the 1980s and unmaintained since. “I should declare an interest as the founder Secretary of The Railway Taverners CC. We used to play at Tottenham Hale’s Down Lane Park in the early 1980s. When the North/South route was built the park lost some land and we were moved away. Despite promises from Haringey Councillors that cricket would return, it never did, nor did we”. The proposal is part of a large development proposal to build another 1600 housing units on top of the original 2500 to house 10000 people planned for the Tottenham Hale area. Councillor Claire Kober, Leader of the Council, came and listened to our views on Monday eve 27th July 2009. She has since written to us to say the proposal still stands but states that an alternative proposal will also go out with it for public consultation. Local people will be invited to give their views on which option they prefer. This consultation she says will take place late this year or early next year. She writes that the Council does not have a pre-determined view and wants an open consultation process. However we are very concerned that the option of building on the park remains and the principle of building on park land has already been approved in contradiction of its own fundamental environment policies. We are also concerned that there is no commitment to creating a new playground and youth facilities in the alternative option even though there is de facto that commitment in the swap option.So we are saying that Haringey's cabinet should reverse its position and commit to the principle that park land is sacrosanct and that there be no house building on Down Lane Park ever. Also we are concerned that the dsitinction of open land and park land is not immediatley obvious so people may mistakenly think there is no loss of park land in the proposal. It must also spell out the impact on the rest of the park. Especially in option 1 it must reinterate the commitment made in the Tottenham Hale Masterplan (2006) "to enhance the park and improve the southern section of the park , which could include a new children's play area and new youth facilities"
So it’s up to us. Please support our campaign. You can support by writing to the local media or by contacting your local councillors especially those in the cabinet or by offering your support to us in our fight. The approval of the principle of building on the park was taken despite the fact that there were alternative options eg use all the vacated recycling depot for house building instead of building on the park. (This is not a recommendation just a pointer to another option for comparison. Note: Some concerned local people object to any blocks of flats so crowded and near local housing). "This open space ‘land swap’ option is seen as offering the greatest potential over time for major growth allowing as it does higher density development closer to the Station/bus interchange where public transport accessibility is greatest." Officers explain that this means that Haringey can build up to 5 stories in the recycling centre whereas they can build a whopping 8 stories on the southern end of the park. Building on the park also raises more revenue for the Council. Haringey planners have not worked out yet how many housing units they can build in each of the recycling centre and the park. Without this information neither the Cabinet nor ourselves can quantify and compare the different options. Yet the Cabinet never asked for this information.? Buying a pig in a poke is an old and apt expression for Haringey's Cabinet decision making performance. Link to Webcast of Cabinet meeting: Click on this link. Then Scroll down to the Cabinet meeting and click on word Cabinet. When the webcam is running move the blue moving cursor below the screen along till the time (on lower right of picture) gets to 2.7.17 and watch for a few minutes. A pretty flippant discussion on Transforming Tottenham Hale took from 2hrs.7 mins to 2hrs.12 mins all of 5 mins. Haringey's Cabinet reversed its policy on open land and adopted the principle of building a housing estate on Down Lane Park without any mention/discussion/question on the issue in the meeting itself. Transforming Totteham Hale (PDF 926KB): Scroll to paragraph 6.48: Page 12 /20 'open access' & Plan 2 statement.